Roll Cloud Over Wisconsin What kind of cloud is this? A type of arcus cloud called a roll cloud. These rare long clouds may form near advancing cold fronts. In particular, a downdraft from an advancing storm front can cause moist warm air to rise, cool below its dew point, and so form a cloud. When this happens uniformly along an extended front, a roll cloud may form. Roll clouds may actually have air circulating along the long horizontal axis of the cloud. A roll cloud is not thought to be able to morph into a tornado. Unlike a similar shelf cloud, a roll cloud is completely detached from their parent cumulonimbus cloud. 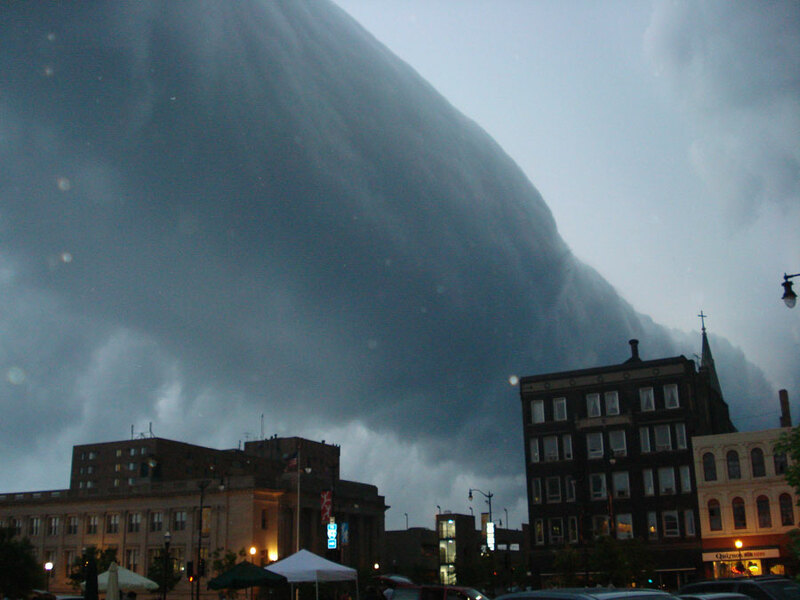 Pictured above, a roll cloud extends far into the distance as a storm approached in 2007 in Racine, Wisconsin, USA. APOD keeping it down to earth! This entry was posted in Shared Stuff, Weather. Bookmark the permalink.